Food packaging, cosmetics, chemicals, pharmaceuticals. Renowned companies throughout the world benefit from working with Breitner machines, which are designed to provide long-term performance, require minimum set-up time, save energy, need low maintenance levels, and therefore have a long working life. Breitner design and manufacture single station, and high speed rotary capping machines to the to meet European directives and the highest German manufacturing standards. Each version has a wide range of standard options to ensure optimised operation is achieved eg, diagnostic interface, ATEX compliance & fume extraction Nitrogen injection etc. Single station capping machine capable of outputs up to 60 containers per minute with smooth, intermittent star wheel operation. Servo driven spindle operation for measureable capping torque level application. Closure height detection also available. Continuous motion servo motor capping available to eliminate spills which can occur with intermittent capping motion. Quick format part change overs. High production output machine equipped with up to 5 servo motor drives for executing complex operations. Capable of applying pumps, triggers, push on caps, crimps, pouring aids etc, on the same machine. Highest production output machines capable rates up to 350 containers per minute with up to 12 capping heads. Suitable for complex capping operations eg triggers, pumps, press on etc. 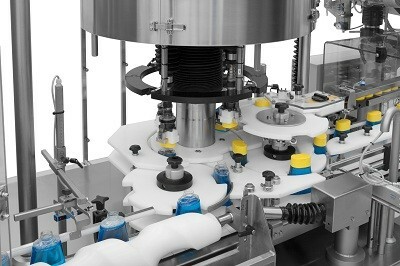 Also available in monoblock (joint filler and capper machine) configuration.